Or, will she have to trust the scarred stranger who shows up out of the blue cloaked in lies and secrets? Doing so means giving up on Joshua. But betting on Joshua's love could do more than break her heart. It could kill her. Where do I even start? I read this book with an Instagram book club and we had so much fun getting to know the characters in this book! Dempster sets the tone of the book off with a big explosion of action in the first sentence. Aubrey and her mother are in the middle of complete madness. My heart was beating out of my chest from the first line to the very last. Now, let’s talk characters. Dempster created amazing characters that are very easy to love and hate. I love Aubrey and Tessa and their adorably relatable relationship. I hate Joshua and Morgan and their sickening bond to each other. And Coy… what is there to say about Coy other than the fact that I’m drooling while typing about him. He’s strong, courageous, and madly in love with our leading lady Aubrey. Insert cat heart eyes emoji here ladies and gentleman! Dempster’s writing is full of action and suspense and gives the reader just enough information to be on the edge of their seat and constantly, I mean CONSTANTLY, wanting more! I absolutely loved this novel and can’t wait for the next in the series. 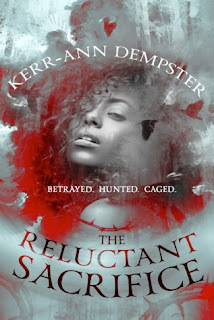 I recently interviewed the author Kerr-Ann Dempster and will be featuring her on the blog this Wednesday so check back for her thoughts on writing, The Reluctant Sacrifice, and some advice for aspiring writers! Thanks for checking in readers.